The standard for inclusion in Global Finance’s ranking of the World’s Safest Banks rose in 2014, largely because highly-rated new entrants have squeezed out those at the lower end of last year’s list. This year, two A+ ratings and a third rating in the AA range are the minimum standard to reach the top 50. In previous years an average rating of A+ was sufficient. As in previous years, the top 10 positions are occupied by European banks. This year all 10 of those institutions are either government owned or enjoy some form of sponsorship for their government or from government agencies. France’s Société de Financement Local (SFIL), recently created by the French government to support public-sector financing, enters the rankings for the first time. Rabobank, which was ranked 10th last year, falls to 15th following a downgrade by Fitch in November 2013 and cedes its position as the strongest private-sector bank to Canada’s TD Bank Group. Four institutions still boast AAA ratings from all three major international credit rating agencies, compared with five last year. Germany’s KfW claims first place, followed by Switzerland’s Zürcher Kantonalbank. Landwirtschaftliche Rentenbank and L-Bank, both from Germany, take the third and fourth places. Nederlandse Gemeenten, based in the Netherlands, lost its AAA rating from S&P in December 2013, and falls to fifth position in this year’s rankings, compared with second last year. European banks account for 19 of the top 50 banks, two more than last year as a result of the addition of SFIL and Switzerland’s Banque Cantonale Vaudoise. Many of these 19 European banks are commercial banks that do not rely on state sponsorship: Nordea and Svenska Handelsbanken from Sweden continue to rank highly, as do UK’s HSBC and Finland’s Pohjola Bank. Five US banks are included in the top 50, compared with six last year. Northern Trust drops out following a downgrade from Moody’s in November 2013. BNY Mellon falls from 31st place to 47th following a downgrade from Moody’s in November 2013, ceding its position as the highest-ranked American bank to CoBank and AgriBank, which take 39th and 40th places. Six Canadian banks continue to feature in the top 50. Caisse centrale Desjardins, at 26th, is the smallest bank in the rankings, with assets at the end of 2013 of $32.7 billion. The three leading Singaporean banks feature strongly again. DBS, Oversea-Chinese Banking Corp and United Overseas Bank take 12th, 13th and 14th positions, exactly as they did last year. South Korea contributes four banks to the top 50, one more than last year, as a result of the inclusion this year of Export-Import Bank of Korea (ranked 42nd). Similarly, China’s contribution rises to three from two, owing to the inclusion of Export-Import Bank of China (ranked 33rd). Hang Seng Bank of Hong Kong (ranked 24th) takes the combined total for Asian banks to 11. Four large Australian banks take the positions from 17th to 20th. Four banks from the six-state Gulf Cooperation Council feature in the top 50, with National Bank of Abu Dhabi leading the pack at 25th, followed by National Bank of Kuwait (ranked 41st), Qatar National Bank (ranked 49th) and Saudi Arabia’s Samba Financial Group (ranked 50th). Only one bank from Latin America—Chile’s BancoEstado—scores highly enough to rank in the top 50. Banco de Chile, which featured at 48th last year, has not suffered any downgrades, but this year its score is just short of the level required to claim a place in the top 50. 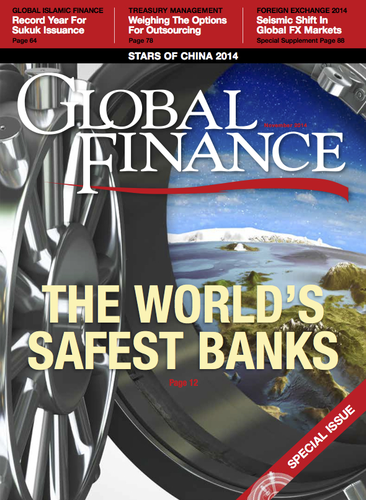 No banks from Central and Eastern Europe or the Former Soviet Union come close to scoring highly enough to feature in the Safest Global Banks rankings. The regional rankings for CEEFSU continue to be led by Česká spořitelna and Komerční banka from the Czech Republic, followed by banks from Poland and then from Russia. Since last year’s ranking was published, Poland’s BRE bank has rebranded as mBank. It appears sixth in the regional listing, just as BRE did last year. No banks from sub-Saharan Africa come close to scoring highly enough to be ranked in the Safest Global 50. All the banks featured in the regional list for the Middle East come from the GCC. Many of the world’s largest banks still fail to score highly enough to make the top 50. BNP Paribas narrowly misses out on the top 50, but Deutsche, JP Morgan Chase, Royal Bank of Scotland and Santander will need much-improved ratings to qualify. To be eligible for inclusion in the Global and Regional Safest Banks listings, banks must rank among the largest 500 in the world by assets, and they must also hold a rating from at least two of the three major international credit rating agencies. A sub-investment-grade rating from any of the three agencies disqualifies a bank from inclusion. Eligible banks are then scored, with 10 points being awarded to an AAA rating, descending to one point for a BBB- rating. Where a bank is rated by only two agencies, an implied score for the third rating is calculated by taking the average of the other two and deducting one point. Wholly-owned subsidiaries of other commercial banks are not eligible. Banks with the same points are ranked by asset size, reflecting the strong positive correlation between bank size and high ratings.